The below picture was taken of Ella this morning at breakfast. I wanted to document how colorful her black/purple eye is. Once I brought the camera out she couldn't resist "cheesing". She really has been her normal self just more lovey and wanting to be held most of the time. We've been giving her Ibuprofen to help with the swelling so she's been taking 2 long naps during the day and sleeping her normal 11 hours at night. The picture below was taken on Tuesday when Jack was playing with his stamps and Ella got into the red ink. As you can see she was NOT happy that I took the ink from her. Doesn't she look like she's been in a slasher film? Her tears were even coming out red! Thankfully it wiped right off. 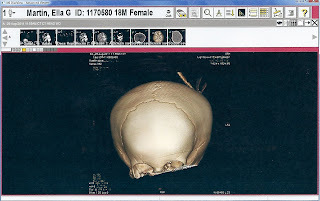 The below picture is from the disc they gave me of her CT Scan. It's crazy to look at your child's skull. If you click on the picture you can see the crack(s) right above her right eye socket. "Mommy hurry you're going to miss the parade!" "Mommy we have a firetruck in our parade"
And if you were wondering...yes our kids hang out in their undies a lot in the summer time! The other day we were out enjoying the nice hot weather we were having by being in the pool. The boy actually let me toss them in the pool and they were loving it. After they were done with that Jack just decided to sit on the edge and Owen decided he should hit the water with a plastic baseball bat. In the videos it's hard to see, but almost all the water was being shot back at Owen. Jack is screaming his head off like he's being murdered. Who knows what our neighbors think! So this morning was a normal morning....we ate breakfast, got dressed and then went outside. While I was picking up the toys the kids were playing in the yard. Then the day took a turn for the worse....I'm not even sure what I heard or if I just saw her, but the next thing I knew I was dropping everything in my hands and running over to pick Ella up off the ground. She had fallen 4ft from the top of the kids slide down onto the sidewalk/curb that is by our front porch. If you look at this picture on the right side you can see the slide in the background and the curb in front of it. Her body fell over the side rail of the slide and was wedged between the slide and the curb. Scary! When I got to her I was sure she was either going to scalped or bleeding profusely. I picked her up and was expecting tons of blood, but there wasn't any. There was a GIANT goose egg and lots of scratches though. It took a long time to calm her down and then after checking her out it became apparent that I needed to take her to the ER. Her forehead was SO swollen it looked like she had a dent on the side of her head and her eye was almost swollen shut. I call my friend Kim and she came over to watch the kids and then we went to St. Francis. I swear they are going to know me by first name soon! If you haven't been able to keep track this is the 5th time I've been to the St. Francis ER this year. Heaven help us! This picture doesn't really show how bad it is...the goose egg was so big! When we got to the ER one of the trauma nurses was coming out to get another patient and then she overheard me telling them what happened to Ella and she decided to take her right in. Since she fell from a height that was twice her size she fit into the trauma spectrum of things. So we went right back and they decided pretty quickly to do a CT Scan. They knew they would need to sedate her since she would have to hold completely still. I told them about her pass experience with Ketamine and how I would like to avoid that again. The nurses, doctors and pharmacists consulted and decided to just use Propanol instead and it worked great. She wasn't even out of it really. It only made her still for about 2 minutes and then she was back, but that's all they needed. The CT Scan came back and showed that she did indeed fracture her skull, but thankfully it's not caved in and will heal on it's own. 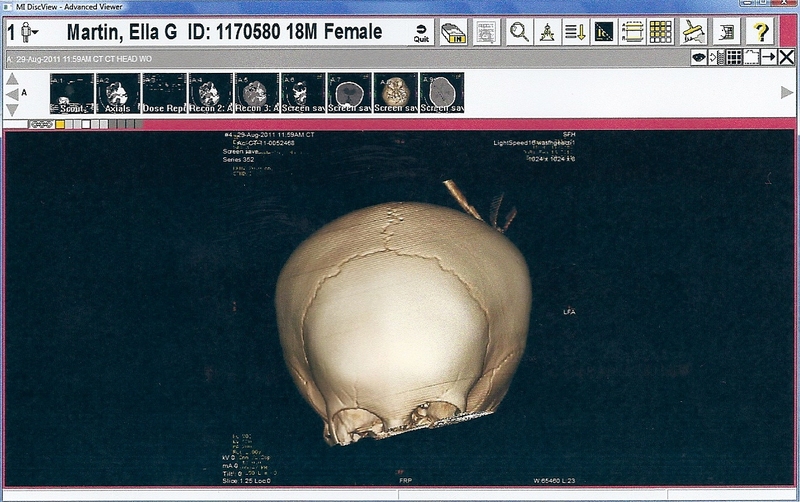 It also showed something else that is a little concerning....Ella has fluid in her brain. We all have fluid in our brain, but she has extra fluid. The doctor at St. Francis consulted with a Neurosurgeon over at Mary Bridge and he is sure that this fluid was not caused from the fall, but has been there for a while. She does have a pretty big head for her age...in fact at 12 months old her head was measuring the size of a normal 20 month old. The Neurosurgeon wants to see her this Friday to get to the bottom of the fluid issue. This could mean a lot of things or nothing at all. If she's had it her whole life it could be that she just has extra fluid and it's nothing or it could be dangerous and she might have to have a shunt put in at the base of her skull to help drain it. Today has been a bit unsettling to say the least! Thankfully we are home and Ella was walking around being her crazy fearless self immediately! We are on orders to wake her up every 3 hours tonight and we are prepared for her to look worse tomorrow morning. Right now Ella's favorite word is Daddy so Michael was taking advantage of that by asking her questions like, "Who's your favorite person in the world?" or "Who's the smartest person in the world?" It was funny so I wanted to get it on video, but of course when it comes to kids the moment you want them to do something is the moment they don't cooperate. She does end up decided to perform for us! She might look like a sweet little girly girl in her dress, but this girl has seen enough of dirt during her 18 months that she knows just how to dive in herself. Jack LOVES to make mud and jump, jump, jump in it! Whoa...that's a lot of mud! A few months ago I purchased tickets to ride an old Steam Train out of Centraila from Groupon for half price! So last Sunday it was time to use the tickets and have some family fun! The train has an open car right behind the engine and then two covered cars followed by another one car at the end. We decided that with Owen's noise issues we'd sit as far away from the engine as we could. We did bring earplugs, but he didn't want to wear them. Love how Ella is swished between us in this picture! This boy was in heaven! Ella loved "drinking" water from the water bottle. She spilled more than she drank, but it was such a hot day it didn't matter one bit. and just enjoyed the fresh air! After a while Owen wanted to walk all the way to the back to look at the tracks. That's where we met the Conductor. He was a really nice guy and I found out that the train is ran by his family. His cousin was the one that would switch the track, his Dad was the Engineer and his Mom ran the candy cart. I had been waiting for a shot like this...love that look of a train going around a corner! Once we got to the end of the line the Conductor told us the engine would detach from the train and ride down a parallel line and then attach instead to the train from the end we were on and then it would take us back. Waiting for the engine to come! Here's the engine backing up beside us. We found out the parts that hook the trains together are called knuckles. Owen was fascinated with them! It was neat to get to see the train THAT up close and personal. I was sure that once the train got that close Owen would run for the back and not want anything to do with it, but he's really gotten brave. He just stuck his fingers or thumbs in his ears and enjoyed the ride. Jack liked the train ride, but probably the least...I'm not sure if he was tired or just not as interested. He didn't have a bad time though. I thought this was a fun shadow of me standing in the corner of the car. After a while we decided to go sit down inside and have snacks in one of the covered cars. It was probably the hottest day we've had all year and I didn't put sunscreen on any of us, but thankfully we didn't get burned. The kids sure did look flushed though. Happy Mama & Happy Boy! It wasn't long after we had snacks that we were pulling back into the station. It was about an hour and a half ride of pure fun and great memories! NOPE!!! This is how we found him....we'll not exactly the lid to the toy box was actually shut! Tonight the boys wanted to sleep together, but I'm not sure if they are even going to get any sleep. I sure hope they do though because I want to get a cute picture! Every Monday when Richard drops Logan off he brings a bag with her clothes for the week. Then I get to go through them and figure out which clothes I want to dress her in. Last Monday morning I chose this cute little pink dress with brown leggings. Then when Ella woke up and it was time to dress her I figured it would be cute to put her in her pink dress and brown leggings and take pictures. Two cute girls! And he loves every minute of it! Call me crazy, but I am a Chapstick fanatic! To top it off I really only like Peppermint Chapstick. It all started years ago when I bought a mega pack of Chapstick at Costco. It came with 8 and had a bonus one that was Peppermint. At first I was sure I was going to hate it...in fact I almost gave it to my friend Kim since she loves peppermint stuff. Of course I ended up loving it, but by the time I finished it it wasn't Christmas anymore so I couldn't find them at any stores. Michael ended up surprising me and ordering a bunch online. Fast forward to now, I was on my last two tubes! By last two I mean that one had been picked at by my pinkie fingernail to the point where I could no longer extract any and the other one wasn't much better. So....last week I could take it no more (I was trying to wait until my birthday, but my lips were screaming in withdrawal) so I gave in and ordered 6 of them online from DrugStore.com. Can you hear it? My lips are saying ahhhhh! Lately it seems like Owen is really turning into a big boy. He can take care of so many things on his own and he loves being given more responsibility. His new favorite thing to do with me is empty all the garbage's. Other things that he can do by himself (some of them he's been doing for a while now) is get his own cup of water or milk, get a cup of cereal as a snack, put peanut butter on his sandwich, open the door of the van (it's not as easy as it sounds), unbuckle his seat belt, wash his hair, brush his teeth without any assistance and towel dry himself off. I'm sure there is more that I just can't think of too. Lots of little things that add up to a lot of independence. Our garden didn't do the best this year, but how could it with the weather we've had. Even so, the zucchini did GREAT! So in an effort to use it all we've been trying new recipes. This was our second new recipe and it was supper yummy and easy! Of course I changed a few things like adding cubed chicken and sauteing the veggies instead of boiling them. Also I didn't have unsalted butter, but normal butter tasted just fine. It will absolutely be a summer favorite from now on! Because It Might Be The Only Summer Day We Get! What...You Don't Seatbelt In Your Veggie Tray??? Even Butter Isn't Safe In Our House! The Centre @ Norpoint Sprinkler Park! How To Wash A Car According To Ella Grace! Garage Sale AKA The Death Of Me!